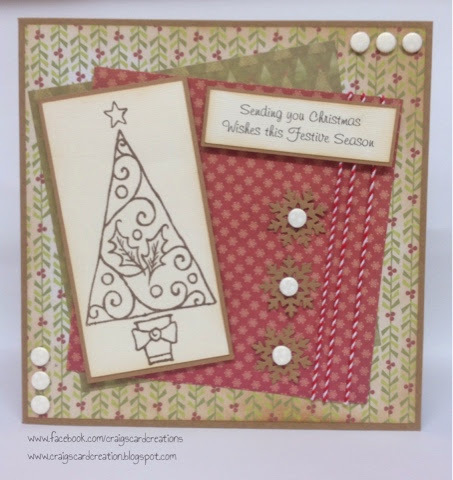 Crafting With Craig: "Rocking around the Christmas Tree" 8x8 card. Holly Tree stamp - Woodware craft collection. Traditional Christmas Greetings - Woodware craft collection. 12x12 sheet - Back to Basics Modern Christmas paper - Trimcrafts. X2 6x6 sheets Back to Basics Vintage Christmas papers - Trimcrafts. 8x8 Kraft card card blank - Docrafts. Cream Textured card -Bazzill Basics. Rich Cocoa ink pad - Momento. Festive Twine - Own Stash. Vintage Photo distress ink - Tim Holtz. Ultra Strong Double Sided tape.